"This recipe will yield the most tasty and delicious steak that you can ever imagine." Place onion, garlic, olive oil, vinegar, soy sauce, rosemary, mustard, salt, and pepper into the bowl of a food processor. Process until smooth. Place steak in a large resealable plastic bag. Pour marinade over steaks, seal, and refrigerate for about 3 hours. Brush grill grate with oil. Discard marinade, and place steak on the prepared grill. Cook for 7 minutes per side, or to desired doneness. See how easy it is to make your own Asian-inspired BBQ sauce. I marinated this meat overnight and it was much too strong and overpowering. Yummy. 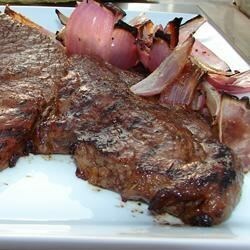 Works with sirloin or any other steak that is good marinated. I blended the ingredients in a blender and it came out great! I poured it over our steak and let it sit for a day. Then my husband grilled it and the steak was excellent.